Photo © Samsung / All rights reserved. 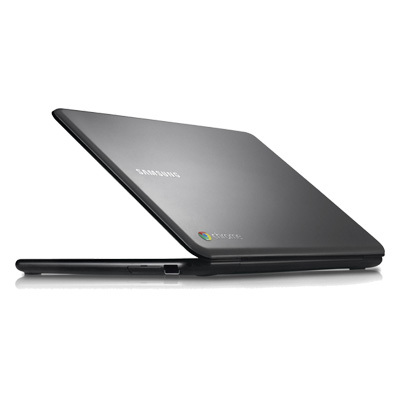 New Google Chromebooks and the Chromebox were showed off at the Samsung booth At CES 2012. Remarkably thin and a metal case, makes them look a bit more elegant. 12.1 inch screen for the biggest model of the series 5. Most of the other features are the same to the old Chromebooks. Price will, unfortunately, be in the region of the old models. The costs of a Chromebook was always the most criticized point. The Chromebox is a highly interesting device. 2 Monitors or TVs are attachable. For Web-Kiosk, or to make your TV a websurf-engine, it's perfect. Enough USB-Ports and a small size makes this very versatile. Too bad there is no recording software or extensive multimedia applications available for ChromeOS (yet). Personally, I think it's a bit frustrating that the price of the Chromebooks are not falling. In my opinion they are still too expensive for the usage they bring. And 12.1" screen is okay. But why not bringing a Chromebook with 15" or 17" screen finally. It would be great for teh web. With a tiny screen, it doesn't makes the web comfortable to use. The Chromebox... well. Let's see if people like to hook that up to their TV. Of course it's perfect for presentation and info-stations. Or if you want a low energy surfing station at your home. I'm 90% of the time in the web only, and together with the screen, my system consumes about 305Watts. You know what I mean. This does compete with Google-TV, right? But again, can this be good enough to drag one away to buy the new Acer S5 Ultrabook ? I'm not fully convinced.